Vancouver, B.C – Cathay Pacific is welcoming applications to its I Can Fly (Vancouver) 2017 program, inviting young Canadians with a passion for aviation to join the popular program. Grade 11 high school students from the Greater Vancouver area may apply online at www.cathaypacific.ca/icanfly on or before 30 March 2017. The I Can Fly (Vancouver) 2017 program will run from April through June and offer high school students a rare behind-the-scenes look at the airline industry. 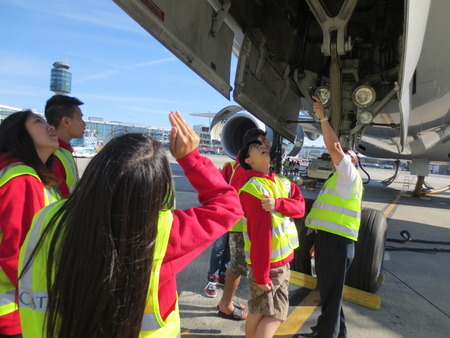 Led by Cathay Pacific employee volunteers, the 7-week academy covers a range of aviation topics and explores various careers in the industry from engineering to airport operations to passenger sales. The program runs weekly and operates after school hours out of Vancouver International Airport or within the vicinity of downtown Vancouver. The I Can Fly education program was launched in 2003 at the airline’s headquarters in Hong Kong and due to its success was brought to Canada for the first time in 2009.